The book is targeted at the candidates appearing for the MRCOG Part 2, which is a compulsory examination for postgraduate trainees in the UK who aspire to pursue a career in obstetrics and gynaecology. Apart from the UK postgraduates, MRCOG examination is taken by postgraduates all across the globe to obtain this prestigious degree. The examination is carried out twice a year, and the venues are London, Manchester, Glasgow and Belfast in the UK. The examination also takes place in Bangladesh, Egypt, Hong Kong, India (2 centres), Iraq, Jordan, Malaysia, Pakistan, Saudi Arabia, Sudan, Dubai and Jamaica. At each centre, the number of candidates participating varies between 5 and 200. Apart from the candidates appearing for this examination, this book would be helpful for the assessment of knowledge in all postgraduate trainees in obstetrics and gynaecology worldwide. Therefore, this book has a wide target group. 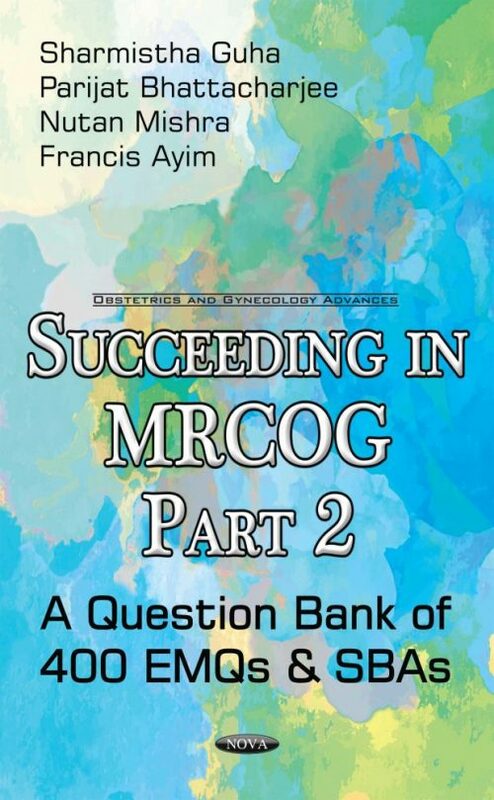 A unique characteristic of this book is that it produces a comprehensive set of both types of questions covering all the modules of the MRCOG Part 2 syllabus (www.rcog.org.uk). A broad range of reading material has been used to develop the EMQs and SBAs including RCOG Greentop Guidelines, Scientific Impact Papers, Clinical Governance Papers and RCOG Consent Advice. In addition to the RCOG revision material, the authors have included questions from The Obstetrician & Gynaecologist (TOG), NICE Guidelines, StratOG and recommended textbooks. The authors have experience in MRCOG examination question writing, and Sharmistha Guha has been a co-lead for the London SBA Writing Group for the RCOG. The questions have been written to the same standard as the RCOG question bank. Mr. Gregory Ward, who is the Head of London Specialty School of Obstetrics and Gynaecology, wrote the foreword of the book. He is a senior clinician, a RCOG examiner and member of the RCOG SBA committee. He has provided guidance continually to ensure the quality of the questions is up to the standard of RCOG. The book is targeted at the candidates appearing for the MRCOG Part 2, which is a compulsory examination for postgraduate trainees in UK who aspires to pursue a career in Obstetrics and Gynaecology. Apart from the UK postgraduates, MRCOG examination is taken by postgraduates all across the globe to obtain this prestigious degree. The examination is carried out twice a year and the venues are London, Manchester, Glasgow and Belfast in UK. The examination also takes place at Bangladesh, Egypt, Hong Kong, India (2 centres), Iraq, Jordan, Malaysia, Pakistan, Saudi Arabia, Sudan, Dubai and Jamaica. At each centre, approximately the number of candidates varies between 50 and 200. Apart from the candidates appearing for this examination, the book would be helpful for assessment of knowledge in all postgraduate trainees in Obstetrics & Gynaecology worldwide. Therefore, the book has a wide target group.